I'm a big card-sender. I send an arsenal of cards to just about everyone we've ever met for, well, just about any occasion under the sun. 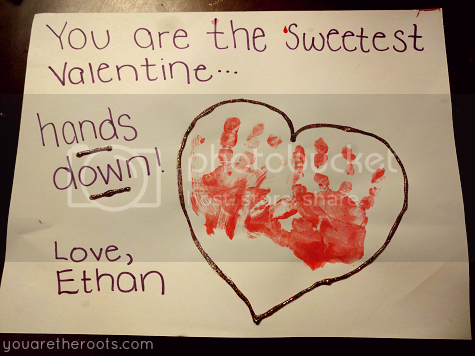 As soon as Ethan was born, buying cards quickly morphed into making cards because, let's face it, little is cuter than something adorned with scribbles or baby handprints. Or footprints. Or little grubby-yet-adorable applesauce fingerprints left unintentionally on paper. So Ethan and I take the easy route when it comes to crafting, taking on little projects that are still packed with lots of cuteness. 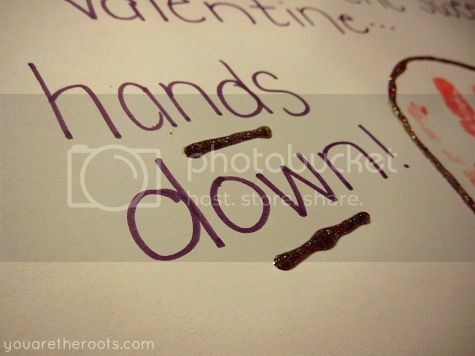 This year for Valentine's Day, I lined up an assembly line of fingerpaints and construction paper. 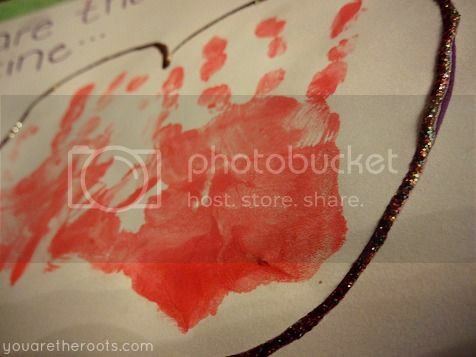 Ethan and I walked the line, dipping his hands in paint and then stamping down a set of handprints as we went. Bam, 20-something Valentines without any trouble (minus avoiding fingerpaint ingestion and a set of handprints adorning the table. Little details!). The writing I quickly did when he went down for a nap. My favorite part about this year's Valentines would be how they're all just so different. That's what happens when you put a toddler in charge. Some simply have one hand print, some have one and a half. 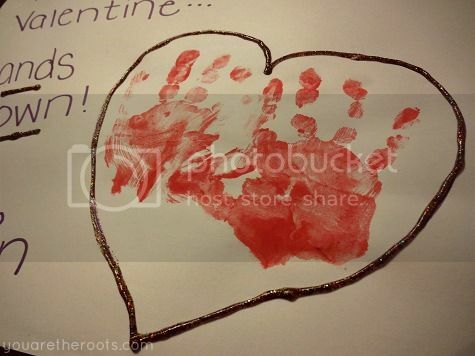 Some have a few fingers in a crinkled, painted corner accompanying one flawlessly good handprint. Most have three handprints and a few fingerprints thrown in for good measure. On a sidenote, it's crazy to watch the handprint artwork accumulate, noting how much bigger the teeny little handprints get over time. Nostalgic mommy-sigh. I totally have the sweetest little Valentine. Hands down. Such a cute idea! You are going to love looking back on things like this and seeing just how tiny your baby was at this point in time!